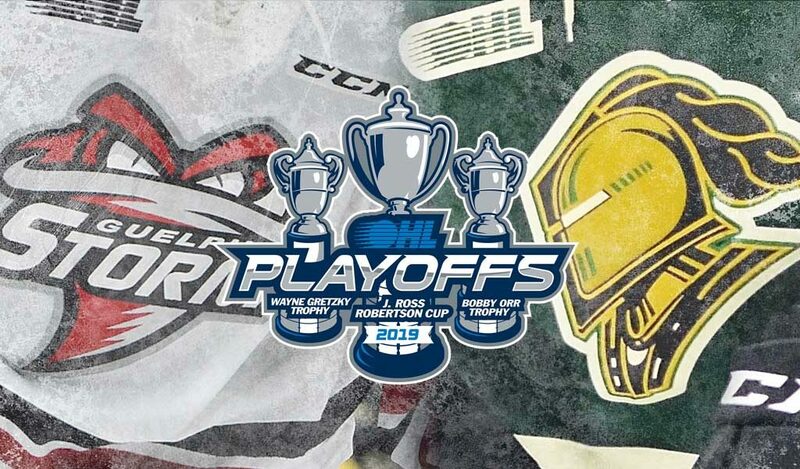 The London Knights looked as though they had things under control, outscoring the Guelph Storm 17-6 over three straight victories to start the series, but things haven’t been so easy for the West Division champions as they’ve tried to finish things off. A resilient Storm club fought to a 4-3 win on home ice in Game 4, bested the Knights 3-1 on the road in Game 5 and returned to Guelph to take a 5-3 Game 6 victory to set up tonight’s series finale in the Forest City. “We’ve been playing for our lives since we went down 3-0, so we’ve got to keep bringing that same attitude,” Storm forward Nick Suzuki told Guelph Today’s Tony Saxon. “It’s going to be one hell of a game probably. Suzuki’s recent surge has had a lot to do with Guelph’s success. The 19-year-old London native has 10 points (5-5–10) over the past four games, putting up multi-point totals in each of those contests. The play of Storm netminder Anthony Popovich has also been a turning point in the series as he’s rebounded from a slow start, providing big saves this past week. With the series momentum running against them, the Knights look to summon support from a capacity crowd at Budweiser Gardens. They where 27-5-2-0 on home ice during the regular season. “It’s always exciting,” Knights captain Evan Bouchard told the London Free Press’ Ryan Pyette. “You dream of Game 7s and want to play in them, especially at home. It’s two strong teams and it’s pretty realistic (that it has come to this point). We obviously wanted to finish it earlier, but it didn’t happen. 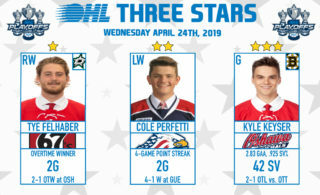 Discipline will be a key to success for the Storm as they go up against London’s top-ranked power play in the OHL Playoffs, one that has gone 15-for-41 (36.6%). Bouchard leads the league in scoring with 20 points (4-16–20), the most by a Knights blueliner since Olli Maatta back in 2012. Fellow first round NHL pick Adam Boqvist leads the OHL with 10 goals, the most in the postseason by a defenceman since Guelph’s Kevin Klein in 2004. Led by two of the league’s most experienced head coaches, the Dale Hunter-led Knights and George Burnett-coached Storm will leave it all out on the ice tonight. 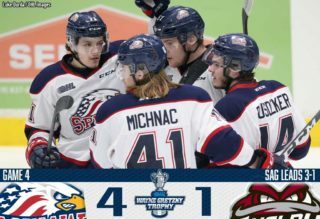 The Knights played a pair of Game 7s in the 2017 OHL Playoffs, being eliminated by the eventual champion Erie Otters on Warren Foegele‘s overtime winner in the Western Conference Semi-Final. 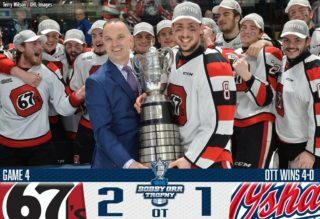 This marks Guelph’s first Game 7 since back in 2004 when they defeated the same Knights in London by a score of 6-3 enroute to an OHL Championship. 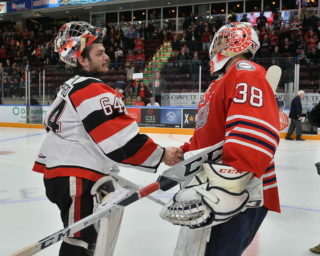 The 2014 Peterborough Petes, 2005 & 2010 Windsor Spitfires and 1988 Ottawa 67’s are the only teams to ever come all the way back from a 3-0 series deficit. The Guelph Storm look to join those ranks tonight but will have to vanquish the mighty London Knights once and for all in order to do so. Be sure to see all of tonight’s action at OHLLive.com, live on the OHL Action Pack or locally in London on Rogers Television.